Micro-Lite® Fluorescent Illumination - The Micro-Lite® FL1000 and FV1000 are the highest quality fluorescent ring illuminators on the market. There are numerous reasons why the FL1000 is the OEM choice in lighting, for some of the largest microscope manufacturers in the world. Made in the USA. Available in fully dimmable, and high/low, the Micro-Lite® line of ESD Safe fluorescent illuminators are the highest quality fluorescent illuminators on the market. Featuring an exclusive Micro-Brite™ bulb technology with rare-earth tri-phosphors, we achieve the whitest and brightest light available from a fluorescent illuminator. This unique technology allows increased lumen output per watt, for greater operating cost savings over the life. 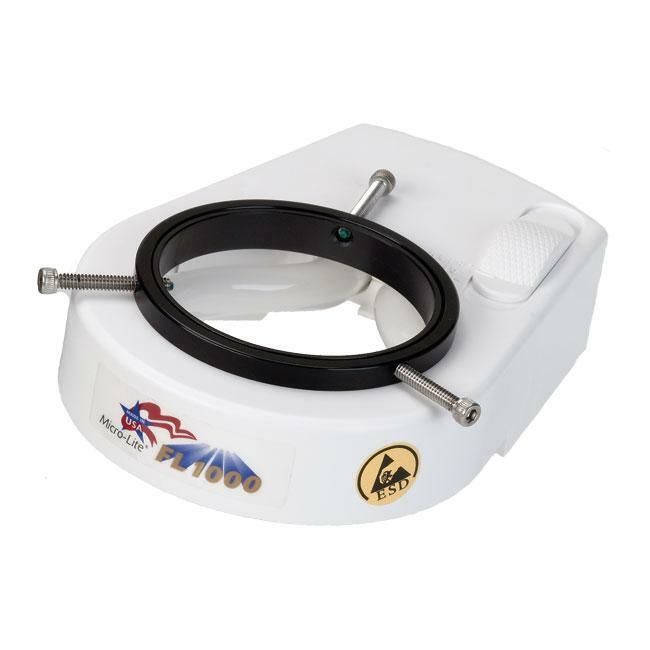 The FL1000 is the ring light that numerous Japanese microscope manufacturers offer in their own product line standard. 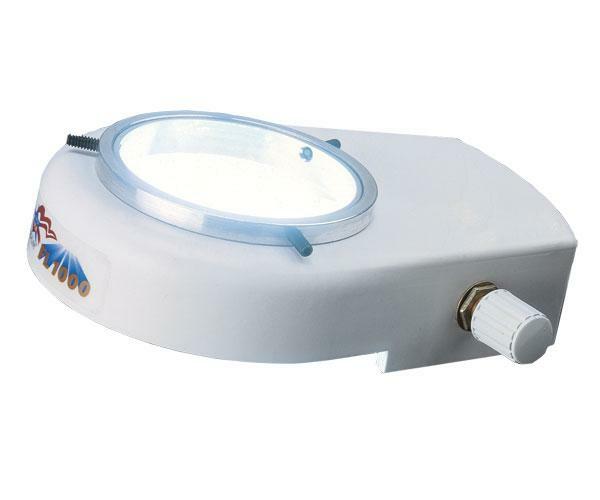 It has high/low intensity adjustment, and features exclusive easy-out bulbs. No longer do you need a screw driver to remove bulbs. The right angle pin design allows for two finger removal and installation of new bulbs. This greatly reduces down time, and helps keep productivity rolling. With specialized ballast technology, you can truly achieve ‘flicker free’ performance. This special technology helps reduce worker fatigue, as well as allows other illuminators to be used on sensitive video inspection systems, that would otherwise be unusable with a standard flickering fluorescent. The FV1000 model is fully dimmable from 100-25%, by simply turning the integrated switch on the light fixture. The solid state dimmable electronic ballast allows viewing of circuit boards, specimens and other critical applications at full intensity or reduced lumen output. You control the amount of light, to help combat glare, or to find the most comfortable light setting for your eyes. Fits objective lenses up to 2.35 inches O.D.